Spanish village streets are made for chariots and mules. 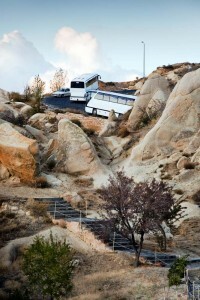 Tour buses should keep out. That insight was reinforced when I came face to face with the Virgin in an Andalusian pueblo. The problem was that I was sitting in a large bus, leading a band of trusting tourists. The bus was edging up a narrow street in historic Carmona, near Seville. So tight was the fit that we were scraping the whitewash off the walls. I was praying for things to get better — and then they got worse. A policeman appeared before us, waving frantically. Behind him we could see the reason. To the solemn beat of drums, an Easter procession in all its pomp and splendour was approaching. A religious brotherhood was marching ahead of a massive, ornate float borne by about 40 volunteers. 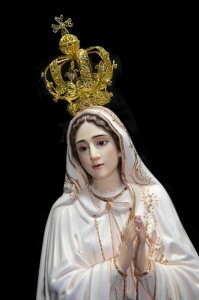 Atop the float swayed an image of the Virgin, serene and unstoppable in her majesty. Only one thing blocked her progress — our bus. We couldn’t go forward, we couldn’t go back. 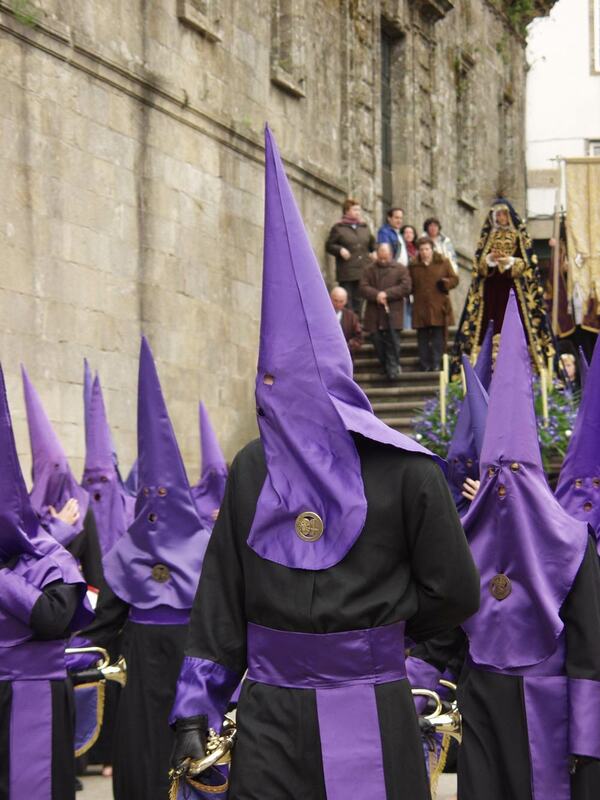 Amid daunting solemnity, faces concealed by their long pointed headgear, the religious brothers paced towards us. To “Vivas!” from the crowd, the Virgin, tears frozen to her plaster cheeks, approached steadily, relentlessly. The policeman became apoplectic. Another day, another crisis, another lesson. Shepherding a group of Americans across Spain — my first and probably last experience as a tour guide — is a true education. You learn that, whatever the situation, you mustn’t panic. Or, more accurately, don’t let the troops see your panic. Once they lose confidence in you, you’re finished. I had been prepared for the usual problems. False teeth, for example. Tourists lose them in surprising places . . . swimming pools, restrooms, discos, aircraft. And their owners expect the guides to find them. Tour operators’ representatives had warned me to expect the worst. Death was one hazard, they said. Tourists have an unfortunate habit of passing away in foreign climes. And then the poor rep has the task of organising disposal of the body. Fortunately, the Grim Reaper didn’t join my tour. But I had other difficulties, including the inexplicable mood changes of our driver Pedro. He never lost his cool, even when confronted by the Virgin — he saved the situation that day by somehow slotting our vehicle down a side-street. Then he began driving like Lewis Hamilton at Silverstone. When we careered into a village only to be blocked by yet another reli­gious procession, he raged in frustration. His moods, it turned out, were related to a mysterious little red car. All through the glorious spring scenery of Andalusia that car tracked us. Finally, the truth emerged. Monica, Pedro’s Italian girlfriend, was in the red car. It was frustration at being late for dates with Monica that caused his mood swings. El Grupo — a compassionate bunch of Californians — agreed that she should join us in the bus. But then Carrie, a super-fit masseuse whom I’d secretly dubbed “Mrs Shwarzenegger”, threw a tantrum. “I’m not travelling in the bus with that woman,” she declared tearfully. It was a case of jealousy. She couldn’t bear the sight of handsome Pedro with another female. To avoid female combat, Monica was returned to her car. On the whole, however, my tourists — all photography buffs — were amenable and good-humoured. It was a mixed cast. Stan, an amiable octagenarian, had worked as an illustrator for Disney films (“What years? From Snow White to Pinocchio”). Cheroot-puffing Sarah, with a hurricane hairdo, looked ready to parachute into a war zone. Actually she was a beauti­cian. Then there was Betty, on honeymoon with her new husband, and a little confused. “Well, I didn’t think much of Seville,” she told me at one point. I was learning a thing or two about tour guiding. Very important, don’t over-dose your charges with information. Keep it simple. Top priority: maintain discipline. If you want to avoid anarchy, forget about consensus and all that nonsense. Once you start consulting your flock about what exactly they want to eat and where they want to go, you end up with chaos. We sipped sherry in Jerez, consumed platefuls of delicious tapas everywhere, watched a bull-run in the medieval hilltop town of Arcos de la Frontera and witnessed “flamingo” (as the group termed it) in Granada. In Carmona, we put up at an old palace converted into a luxury hotel, and clearly under the same management as Faulty Towers. Although tastefully decorated, the place was decidedly fragile. Trying to pull himself out of the swimming pool, one of the group grasped some pseudo-Roman statuery, which came off in his hand. When I tried to flush my toilet, the handle disintegrated. Wrestling with the gilded wash-basin plug, I shattered a glass shelf. Trying to work the bidet, I was drenched when a jet of water hit the ceiling. My go-go Californians’ energy and dedication to sightseeing and photography were disconcerting. Only towards the end of the tour did they relax and begin imbibing something stronger than mineral water. But, oddly enough, what I had thought were disasters were highlights for them. Like being trapped by those guys in the hoods. Holy Granada! That was something!